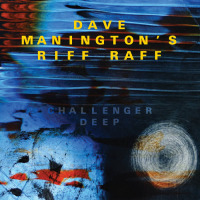 Dave Manington's third album as leader is an intriguing one. It defies the listener's expectations as it progress through its titles. For example, the Chick Corea /Flora Purim-esque opening to "Dr. Octopus" may lead the listener into false assumptions of the Latin kind. Similarly, the ensuing title track, including Tom Challenger's Albert Ayler-like tenor wails and Rob Updegraff's subtle echoey guitar, provides an appropriately aquatic, moody soundscape, augmented by Brigitte Beraha's mesmeric, wordless vocals. There's a lot going on throughout this referentially-titled Challenger Deep. The fact that Manington has assembled a line-up sporting some of the most in-demand players, plus talented soon-to-be stars, also accounts in part for its attraction. The other part is, indubitably, Manington's complex compositions. "The Iliad" is a rockier piece with an engaging guitar solo from Updegraff, whose presence is even more keenly felt on "Random Acts Of Kindness." The folk-ish "Free Spirit" introduces the first lyric-based song, Beraha's multi-tracked vocals acting as an ethereal coda to the tune. Beraha, incidentally, wrote the lyrics to four numbers on the album. The edgy "Prime Numbers" sees Tom Challenger take the helm and "Danger Pig" is embellished by porcine-like squeals over which Challenger solos, totally changing its initial lyrical feel, with Ivo Neame's Hammond providing a pulsating energy. Midway through "Thagomizer" there's a short, quirky, sampled sonic-montage with a "Revolution Number 9" feel. Updegraff's glissando guitar lines reveal a hint of Bill Frisell's influence on the elegant "Willow Tree." The album could be summarised as one that dispenses continuous surprises and delights. There's really never a dull moment. Track Listing: Dr Octopus; Challenger Deep; The Iliad; Free Spirit; Prime Numbers; Random Acts of Kindness; Dangerpig; Thagomizer; Willow Tree. Personnel: Brigitte Beraha: vocals; Tom Challenger: tenor saxophone; Ivo Neame: Fender Rhodes, Mellotron, Hammond organ; Rob Updegraff: guitar; Dave Manington: bass; Tim Giles: drums, percussion.